The new Connacht coach is enthusiastic about the task of improving and developing the talents at his disposal. THERE ARE COACHES who land into a new environment and begin projecting their worldview onto an alien situation. And then, there is Pat Lam. Such was the manner in which his predecessor lived and breathed his job, nobody could have realistically taken Eric Elwood’s vacant seat at the Sportsground without being viewed as an outsider. The former coach of Auckland Blues is acutely aware of the cultural shift he has stepped into. Indeed, he appears to have made it his priority to keep the Elwood/Connacht ethos alive and well. With that, he balances a readiness to break tradition. In his opening pre-season friendly he named a starting 15 for each half and this week he promoted two more experienced men to the rank of captain to make three in total. “One of the things I wanted to identify and challenge the guys was; what does the ultimate Connacht man look like? The net result of his poll among the squad brought the names John Muldoon, Gavin Duffy and Michael Swift to the fore. “I can see the impact that they have. 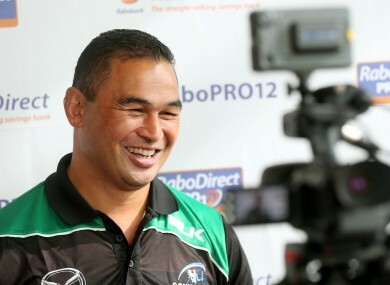 They live what they say,” Lam said at yesterday’s RaboDirect Pro12 launch. Progression and that ‘next generation’ are key points to Lam’s view of his own role. In fact, he cites them as the key tenets of his role with the western province. “What I found when I arrived was that a lot of people were saying, ‘this guy can’t do this, this guy can’t do that,’ the Kiwi told TheScore.ie. “You’ve got to make sure you’ve got a rugby programme that enables each player to get better. At the end of the day, players want to be better than they were yesterday and they were last season. And if we can do that collectively we’ll be better as a team. As Lam speaks, he seems to bounce around in his chair. His eyes widen and squint for emphasis and at times he struggles to conceal a giddy smile. His enthusiasm is infectious – for the job, for the game, for the place he now calls home. “It’s like everyone says; the west is the best. I come to Dublin, I think I’ve been to Ireland. It’s like when people go to London, they think they’ve been to England. I found that when I went to Newcastle and Northampton there are better parts. “When I arrived and asked, ‘what was Galway like?’ Even people from Dublin said, ‘not just Galway, the whole west of Ireland is the best part.’ And, mate, that’s all been confirmed. “My wife pined to go back to New Zealand when I played in England the first time, she got emotional. But she loves it here. Once he starts, Lam is as tough a man to stop talking as he was in the tackle. “Before I come here I need to know why I’m coming here, what it’s all about and who I represent. “It’s great, because everyone loves to be in a job and get paid money, but to be in a place you love being and enjoy working in? Email “'West is best': Lam feeling right at home as Pro12 kick-off edges closer”. Feedback on “'West is best': Lam feeling right at home as Pro12 kick-off edges closer”.